I loved when Bite announced that they were releasing a lipstick shade for each Astrology sign! But, it was such a long wait for the end of October to come around so we could see what Scorpio looked like! I'm a Scorpio born early November and I really like astrology, so I'm in to all the astrology releases! I used to follow astrology a lot more than I do now. I certainly believe I'm a pretty true Scorpio and I believe in the traits, compatibility, etc. I just am not always checking my horoscope or analyzing everyone based on their birthdays! I did always know that the Bite Scorpio shade would be a red - that seemed fairly obvious! But, who knew when they released an orange-red shade instead of a true red, that it would cause so much controversy?! The reactions were pretty intense - a proper Scorpio reaction if I do say so. I wasn't upset about the shade myself. I think Scorpios embody all reds, so I'm okay with it being a little different than people were expecting! Bite explains that they made this shade because Scorpio is a water-sign ruled by Fiery Mars and Dark Pluto. Plus, Scorpios are alluring, seductive and analytical. These are a limited time release so if you are interested in Scorpio, pick it up soon! There are still a few past signs that are available on the Bite website and they also have a vault collection available with minis of all the signs! It is a beautiful orange-red shade and the formula is really nice! It goes on smooth and opaque and the shape is really nice for the lips. Bite formulates their lipsticks with 12 edible oils and fruit butters for a super smooth, creamy and hydrating formula! They also have citrus flavour, which gives the lipstick an orange scent that is so nice and fresh! This is the lipstick with no lip liner on it as I wanted to try the formula on it's own - I know a lip liner would have made the edges a little sharper; but, this was wearable without a lipliner. Also, this is one application with this much coverage! This is the Bite Beauty Astrology Amuse Bouche Lipstick in Scorpio on me - I have to say I love it! I would honestly not have gone out and bought myself an orange-red lipstick; but, I'm so happy to have it! It's a really bold, beautiful shade and I need to put on my confidence on before I wear it out of the house! I also don't have a lot of experience with the Bite Amuse Bouche Lipstick formula; but, I was pleasantly surprised with how it wore. It was really comfortable on the lips and wore well for hours. I did eat and drink with this on and it didn't fully wear off which was nice. It can be a little intimidating to wear this shade out for fear of it ending up all over my face and I did not encounter that at all! The only thing was it transferred a little bit on to my teeth, which was easy to clean up! 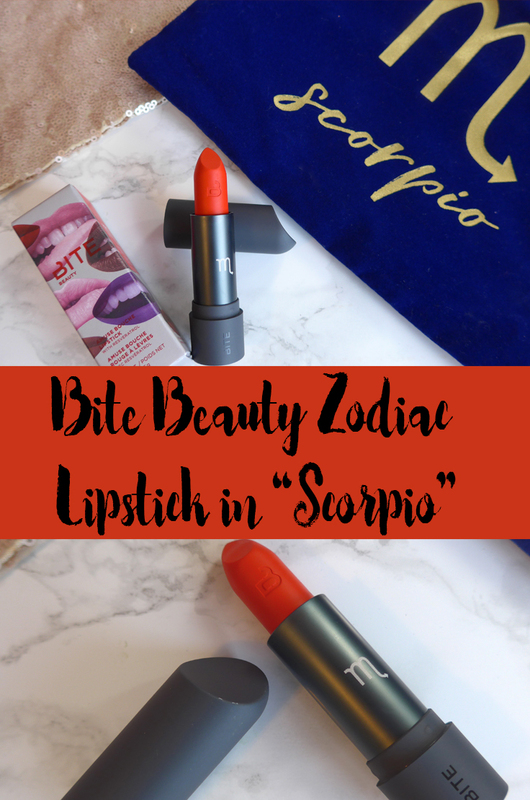 What do you guys think of the Bite Beauty Scorpio lipstick? Did you pick up your sign's lipstick? This color looks great on you. I'm going to have to check what my sign lipstick is. Thanks Jennifer! Some people were not happy with their signs - hopefully yours is good! I love the color. I think it's super fun..just like Scorpios!!! Hahaha - thanks, I agree! This looks amazing on you. I love a bright orange, I actually hate when they are sheer. I got the Virgo and just love it. I love that it was opaque too - I don't think I would have liked this if it were sheerer! It's a great formula! Some orange lipsticks can be a bit sheer, but this one looks soooo opaque and pigmented! And I love the color on you! It was so pigmented!!! Thank you!